Now that the holidays are over Moss and I have really been able to dig in our heals and are really starting to et things done aound here. 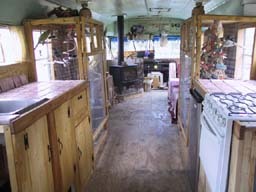 As I mentioned in a previous post, both bird cages are now finished, and look beautiful if I do say so myself. 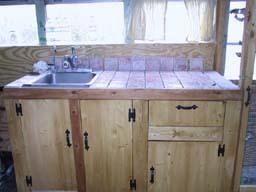 Our new project is the kitchen counter and cupboards, something we have both been dreading.A few weeks back I met a fellow at Home Depot who does custom cabinentry and kitchens. His work is exsquisite. Moss and I got to talking with him and discovered we are kindred spirits, he being a rather ecentric gypsy type as well. We asked him for advice on how to best build our kitchen area, and he responded that he would do better than that, he would give us some FREE Corian counter tops material that he had laying around AND help us install it !! Corian we discovered is REALLY nice stuff and to get it for FREE, well, need I say more ?? He gave us his card and told us to call him when we were ready. Unfortunately, luck was not on our side , as we discovered weeks later, and much to our dissapointment, that we had LOST his card !! We looked everywhere,but it just was not to be found. After the shock wore off and the realization set in that we were going to have to brave this counter top thing alone, we started brain storming. Moss and I have NO clue what we are doing and have never really built anything by ourselves before, well,...anything that did't look like the Honey Comb Hideout school of construction. We figured for the bus we would have someone there to tell us every step of the way what to do, that someone was supposed to be Greg. While Greg has been extremely helpful in many very practical and technical manners, and will be in the future, especially when it comes to the propane sytem, he has not really been able to assist us as much as either he or we thought he would.Health reasons have laid him up and business has taken him away on travel a good deal of the time. Also, though I tried to warn him before hand he really did not think we were as inept as I had told him. Ocasionaly though we are able to get him to come in for a few minutes once in awhile and run our plans by him, and he advise us. Anyway, so Moss and I set down and drew up a plan, and are finding that we really are a perfect team. While I am totally brain dead when it comes to measuring and cutting we have discovered I am quite good at desighning and architecture and he very good at the craftman ship. So, I help figure out how it will all go together and Moss does the actual building. Together we make one fully functioning brain !! LOL ! We spent a good deal of time trying to decide what type of counter top we actually wanted. Formica was out because it was to modern looking, we are going for a real "earthy" look here. A nice oak wood counter with a thick layer of poly eurathane might be nice too. 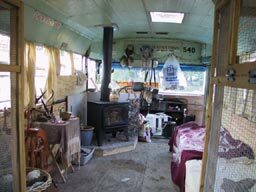 The again, there is a lot of wood in this bus, and it might be nice to break that up a bit and add some color. What about tile , we thought ? Ahh,..but what kind of tile ?? A quick trip to the tile store revealed many types of tile, cermic, stone, glazed, unglazed and every color imaginable. We eventualy chose a nice stone tile, I believe it is tumbled marble. Very nice and natural looking. 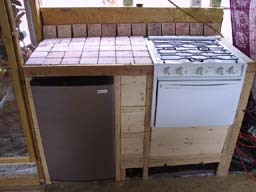 Yesterday we were able to install our fridge and propane oven .It is SOOO nice to have the fridge in here. 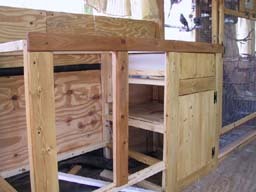 The oven/range still needs to be hooked up, but is in place. The only thing left to do in the kitchen then is finish the tile, build in some overhead cabinets / shelves and some staining and sanding. 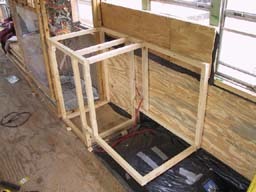 Starting the framework for the kitchen. Putting on the "face" for the cabinet. 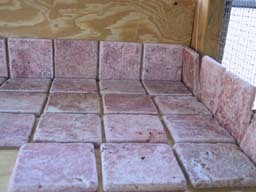 Tumbled marble tile or counter top. Still needing some hinges,sanding and finishing. The somewhat close to finished result. Moss and I celebrated this beautiful New Year by spending the day at Pine Island Beach here in Fl. Would you believe we had yet to even lays eyes on a beach, let alone visit one, since we arrived here in Oct ?? Besides celebrating the New Year, we felt it appropriate given the horrific natural disater that has taken place in Indonesia. After being bombarded with the terible images and stories the last few days, I felt a strong need to visit the ocean ,to just sit in silence and pay homage to all those who suffered and lost lives. I needed to feel and see this familar friend of mine that has caused so much turmoil for so many. The waters where we are, on the gulf side, are calm , smooth and clear as glass.The water does not go above mid thigh, despite the fact that we walked so far out that people on the beach looked to be the size of ants. It was as though we could keep right on walking forever right into the middle of the ocean. There is one other occasion I mark today as well.. 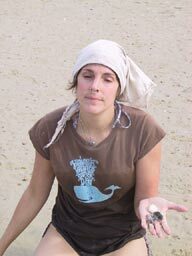 It is the fourteenth anniversary of my own life and death struggle with our beautiful and powerful Great Mother Ocean. Technically, my story begins on Dec 24, 1990,but January first was a very pivotal day,as you shall see,and the one I have since marked as a day to remember the occasion. I will tell it here, although it is a bit long, so do not feel guilty if you skip this entry. I write it more for myself really, than for anyone else. When I was eighteen or nineteen I was a very adventurous gal ( not that I am not now however) and spent a good deal of time traveling by myself and with friends around the country. Yes, I was naive and the innocence of youth was my only exscuse. It came to pass that, on one of my many trips, I settled to live for a spell in the Keys, Key West in particular. I had no car, and my only possesions I carried in a small back pack which contained a few changes of clothes, a book or two (which I frequently traded in for others as I finished them), assorted gems and crystals and some beads that I used to make necklaces to sell. It is during my time in the Keys where I made a friend who went by the name of Today.Today was a gyspy himself, living aboard a small sailboat, sailing up and down the coast exploring the various islands and inlets . He made his living selling his scrimshaw jewelry and artwork to tourists. On Dec 24 we set off from Key West to do some island hoping . We visited a few small mangrove islands and were having a great time. Somehow, we got to talikng, and both of us being the adventurous, romantic types, one thing led to another and before I knew it we had decided to sail to Jamica. The problem was that in order to sail to Jamaica,we had to get around Cuba, and they are not real friendly to Americansin their water space. So, we decided we would sail to the Yucatan peninsula then around Cuba to Jamica.Looking at the map we estimated it should not take more than a week and a half to reach the Yucatan. This boat, I should tell you, was NOT meant for open waters, it was around 12 feet in length, with no motor. Behind us we trailed a nine foot dinghy. We figured we had enough food and water to last us until we reached the Yucatan and we would load up there. I remember on the way out a group of fishrmen warning us it was a bad idea and that our boat was not meant for open water. Foolishly we paid no mind to them. I remember watching the last small chain of mangrove islands and fisherman dissapear into the distance as we headed towards open water. I was suddenly stuck with the realization that 70 % of the earths surface is covered in water, and yet so few have really ventured out into it. I climbed to the bow of our little sailboat and lay back, feeling the waves splash about my ankles and the wind blow against my hair and face. I thought about all the undiscovered animals, caves and lost civilizations that lay for shure beneath the water, and was mesmerized into a half sleep by the gentle rocking of the boat as she surged forward through the water,wind full in her sails. It was a perfect day for an adventure, and what an adventure we were to have. The first few days went smoothly, the wind blew perfectly,and we stayed well on course. Early on, things did get a bit tense when we sailed within sight of Cuba, but we were able to pass unnoticed. We soon realized however that, having no motor on the boat was going to present more of a problem than we anticipated. Without a motor, we were purely at the mercy of the wind . When the wind was not blowing we went nowhere, the ocean was dead calm and smooth as glass.The sun, as we sailed through the tropic of cancer was very hot and burned our skin.There were periods where we would not move for what seemed like days . The other difficulty was actually going the direction we needed to go.We could only really go in the direction the wind was pushing us and often had to do a lot of tacking to go the direction we really needed to. With only a compass and the stars to guide us, it is not as easy as it sounds to stay on course. There were storms storms too, big ones, with 20 foot waves and thunder and lightening. At one point we watched helplessly as a "water spount" grew and very nearly touched down on the ocean right in front of us. At another point,after a particularly ferocious storm, our dingy capsized and was acting as an anchour for the boat.We were unable to get in to tip it over due to some sharks that for whatever reason chose to circle our boat. Eventualy we devised a way to right the boat without having to get into the water. Looking back I realize that Today really was an expert sailor, there is no other way he could have gotten us through those terrible storms or even to land, given the circumstances, if he was not. On dec 31 we had experienced a storm so bad I thought for shure we would die. I went to sleep that night fully excpecting to never wake up,with the sound of the waves crashing and breaking over the deck and the boat rocking violently about in the water. The next day was January first. I awoke, amazed and overjoyed to be alive. After the realization that I had lived sunk in I quickly sat up, pushed open the hatch and was greeted by the most beautiful site imaginable. A rainbow strectched seemingly from one end of the ocean to another, the wind blew strong and steady against our sails, the sun was shinning, and nearby a group of dolphins swam playfully along side our boat. It was definitely good to be alive, and I knew I would live now. Days ago I had asked the universe/ Great Spirit for a sighn that we would make it through, and in my mind this was that sighn. It is intresting the thought process that went through my mind. The first week or so I must have gone through every single memory I ever had, until there was nothing left to think about. The strange thing is, Today was there with me as well, yet we spoke very little with each other and my memories of him are vauge.It is as though I was out there completely alone. Although we were lost only 28 days, it seemed like an eternity. There is nothing more spectacular than the full moon setting on the ocean, something that can only be viewed on the open water. It was around the secound week that we realized we were very likely lost. It was also around that time that we ran out of food, except for some candy cane striped candies. At one point a fish jumped up and landed on our boat. Although I am vegetarian, I was in no position to be picky and we very thankfully fried him up for a tasty meal.That was the only time in fouteen years I have eaten meat. Soon we began to try and contact other ships.Whenever we saw another ship light in the distance,Today would frantically climb the mast with a flashlight, and signal to them the S.O.S signal. Time and time again, we received no response. That is until, The Golden Trident. I will never forget the name. The Golden Trident was a large freighter ship enroute from Mexico City. At first it was just another distant light that we tried in vain to make contact with, but then, suddenly, to our amazement she started to blink back.We blinked, she blinked, we blinked, she blinked until after a few hours she was right up on us. This was one BIG freighter ship. She towered over us like a giant next to our little 12 footer,the waves pounded, threatening to crash us into the side of the ship and the large roataing fan like thing at the back,which was nearly as large as our whole boat. The crew yelled something down in spanish,which neither of us spoke. After several frustrated attempts at communication they went to get the captain,who thankfully did speak english. We told them we were hungry and lost.They responded, explaining we were close to land,100 miles west of Vera Cruz Mexico, and lowered us down some food in a huge burlap sack. Then,wishing us well they drove off. In the sack we found fresh baked bread, cheese, soup, spam , canned goods, water, cookies and much more.We gave thanks and had a delicious meal. The next few days we sailed on and watched anxiously for any sighn of land, often we would hallucinate land where there was none. One day I sat, in my usual spot, at the bow of the ship scanning the horizon for any sighn of land. At one point I thought I saw something, but quickly exscused it as just another mirage. It continued to take shape however, and I squnited hard to make it out. I mentioned it to Today, and he looked as well.We kept scanning the horizon, and soon it became clear, the clouds parted and rising out of the ocean ,was a huge mass of mountains ! Needless to say,we were overjoyed and releived to finally see land. We sailed another day down the coast to find a port, which brought us to Vera Cruz Mexico. I got off in Vera Cruz and eventually made my way up to the states, and Today went on down to Brazil. I realize that it was probably a foolish and yes, a downright STUPID thing to do and that it could have had a very different ending, but it did not and I am glad I had the experience. It it is one that I will remember always, as though in a dream, as that is the nature of the open ocean, dreamlike and otherwordly. Look at the cool shells I found ! Moss relaxes in the shallow ocean waters of Pine Island Beach. 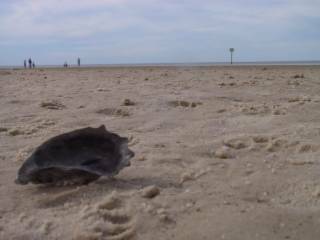 A view from the perspective of a sea shell. A view of what we have acomplished so far. 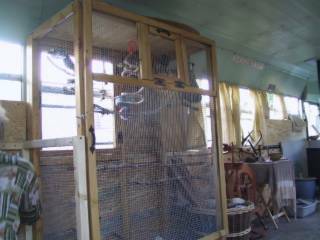 The other finished bird cage.